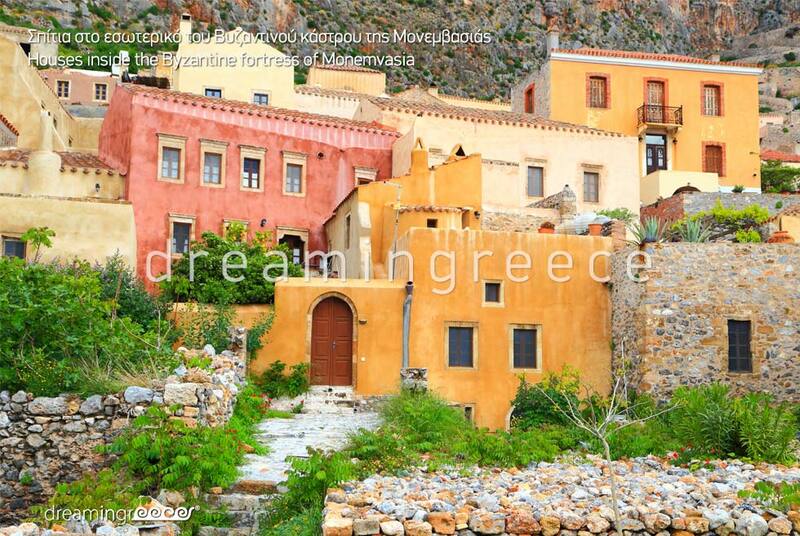 Monemvasia is a fairy town in the Laconia Prefecture, built upon an impressive rock. Medieval walls, tile roofs, arches, fountains, steam baths and cobblestone alleys “dipped” in bougainvillea flowers compose a dreamy scenery! Due to cars’ absence, peace and tranquility is ensured. In the castle of Monemvasia time seems to have stopped! This castle-town, Yannis Ritsos’ (a Greek poet) "stone ship", is divided into two districts: Kato (Lower) and Ano (Upper) Town. The Lower Town is built in the southeastern part of the rock and is surrounded by walls. It is worth “losing yourself” in the labyrinth of the cobbled alleys, a path full of stone buildings, impressive arches, covered passages, houses with coats of arms, clay jars "dipped" in ivies, graphic signs and vintage elegant lanterns. 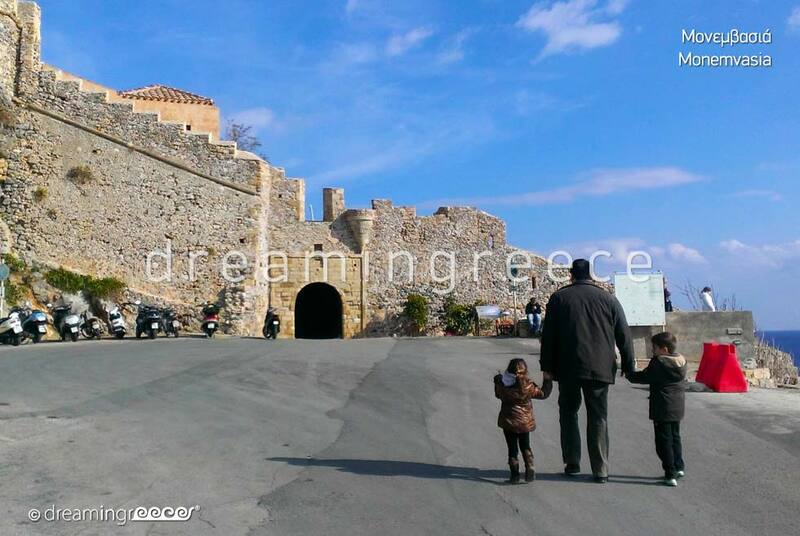 At the entrance of the castle lies Yannis Ritsos’ House, who was born and lived in Monemvasia. Look, also, for the House of Mastrapostoli Rebecca, one of the most characteristic buildings in the settlement, and the Stellaki Residence, a two-storey house with a Venetian crest on the front face. The main alley of the Lower Town leads to the central square with the old cannon, where the largest church in town, Christ the Elkomenos (who is being hauled to The Cross) Church lies. Across the church, the Old Mosque is situated, wherein the archaeological collection of Monemvasia is housed. In the main alley of Lower Town, you will also find the small, but exceptionally interesting museum of gold and silver smithing. Apart from the Church of Christ the Elkomenos, within the castle, there are many other churches, including Panagia Mirtidiotissa (Virgin Mary) and Agios Nikolaos (Saint Nicolas). During your stay at the castle, do not forget to take a walk along the sea city walls. The view of the castle on one side and the deep blue sea on the other, create a scenery which seems to be stolen from a fairytale! In Lower Town, you will find sophisticated taverns, tasteful café/bars and shops selling handcrafted jewelry, souvenirs and local products. In Upper Town, built on the upper side of the rock, the ruins springing up between bushes and flowers, reveal the glory of past eras. Here the impressive Agia Sophia (Saint Sophia) Church, built on the steepest part of the cliff, dominates. From the church, you can enjoy the magical view of Lower Town, the city walls and the sea. Further up the remains of a steam bath lie. 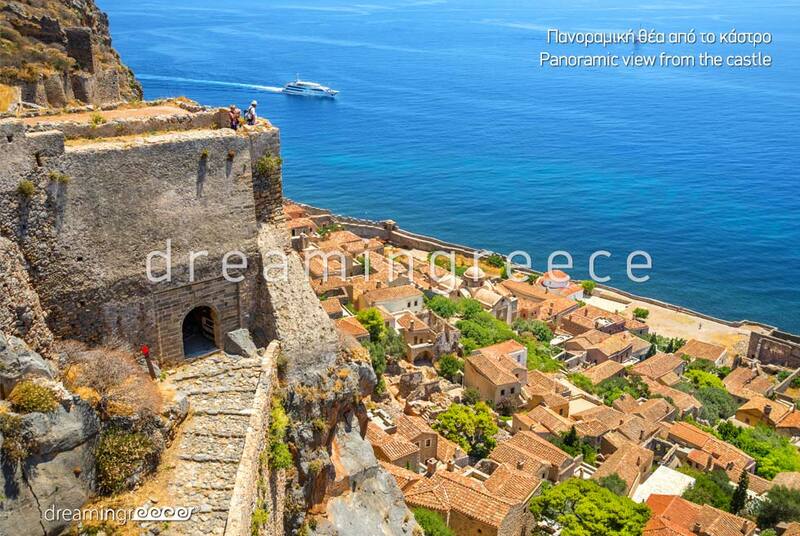 Set on the highest point of the castle, a walled and fortified area; the Acropolis (Citadel) of Goulas. The magical journey through history and time stops at the new city of Monemvasia, Gefyra, which bears all those features of a modern seaside resort. Gefyra is built on land, opposite to the castle. Here, you can find hotels, restaurants, pastry shops and selling stores. The atmospheric Monemvasia, with its impressive rock, its fairytale castle-town, and the natural beauty of the place captivates even the most demanding visitor all year round! 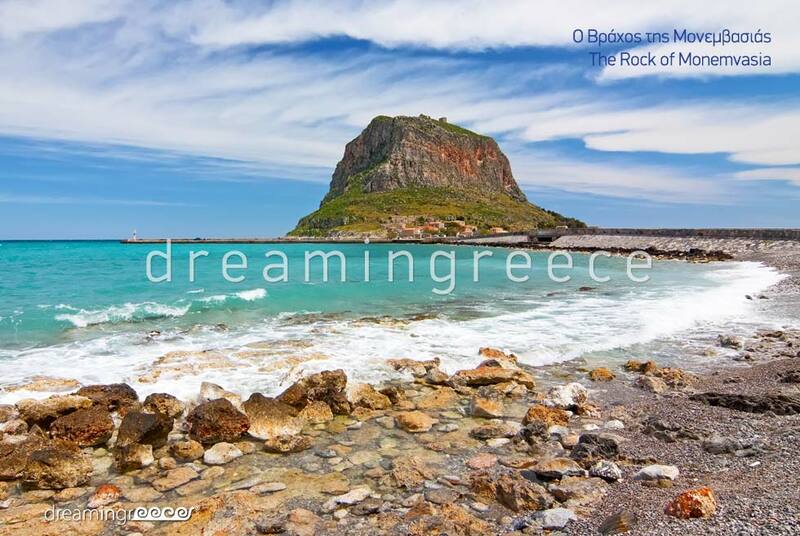 Monemvasia, besides its impressive rock and atmospheric castle, boasts several beautiful beaches. Do not forget to dive in Portelo, overlooking the walls and the castle. The deep blue sea combined harmoniously with the fabulous view of the castle, create a unique sensation! 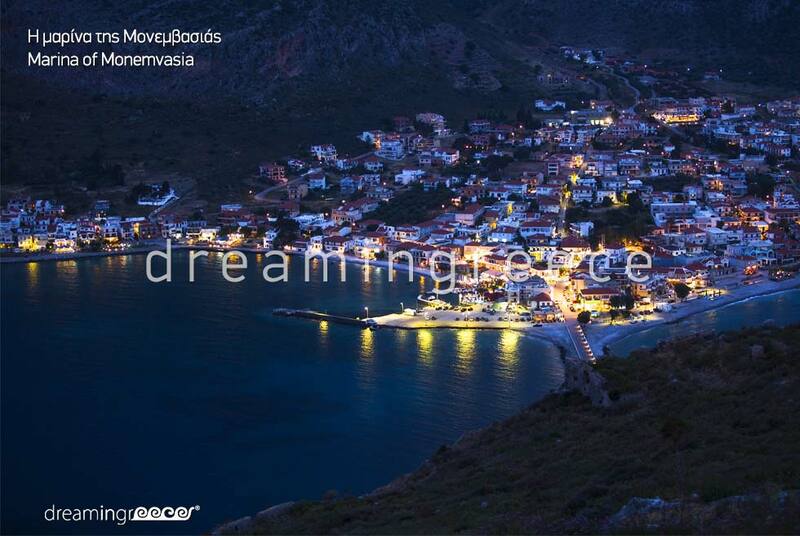 Outside the castle, in Monemvasia’s New Town, you will find the sandy beach of Gefyra overlooking the cliff. The beach offers shallow waters and is ideal for families with children and for those who want to avoid travelling by car. ust north of Gefyra beach, lies the sandy beach of Pori. A small part of the beach is organized and has a beach bar. 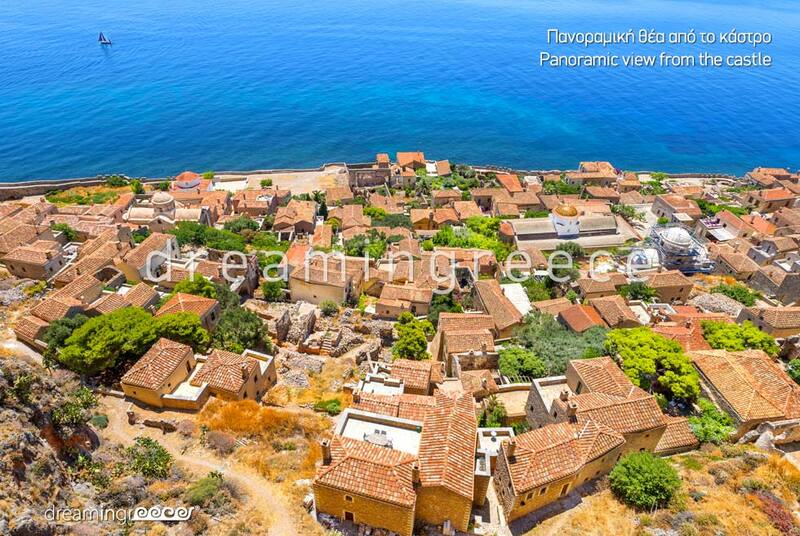 Pori is famous for its magnificent view over the cliff on one side and to the Old City of Monemvasia, on the other. After Pori, you will find Kastraki beach with sand and shallow waters. On the other side, just south of Gefyra beach, lies the sandy beach of Abelakia, with intense geological features and view of the castle. Here you will find sun-beds, umbrellas and a canteen. Following there are the sandy organized beaches of Livadia and Xifias, with sand and fine pebbles. One part of Xifias beach is organized. Continuing south, you will encounter several, successive coves, ideal for those who prefer tranquility and isolation. To reach Monemvasia you can drive from Athens via the National Highway from Corinth to Tripoli (298 km distance - 3 hours and 30 minutes ride). After passing Tripoli, you will keep heading for the city of Sparta and then for Monemvasia. 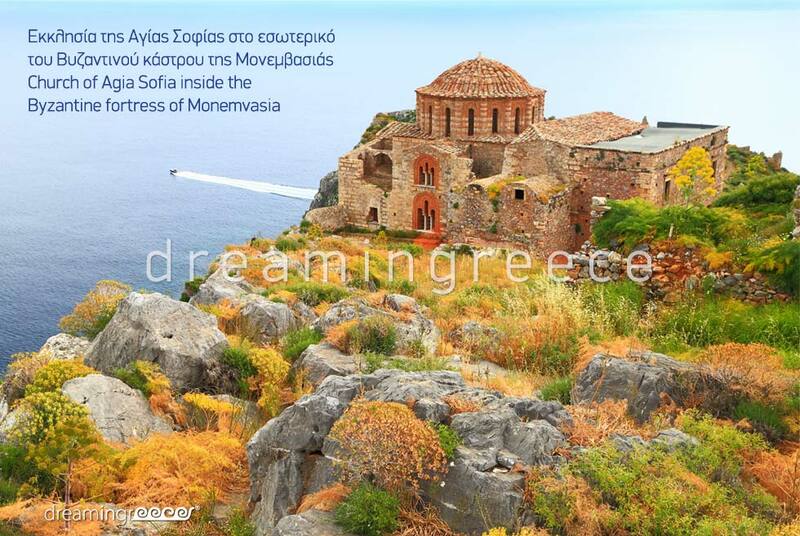 Just after passing the town of Molai, Monemvasia is only 24 km away. The fastest way to reach Monemvasia from Patras is to drive via the National Highway from Patras to Corinth (343 km distance - 5 hours ride approximately). When you reach Corinth, you will take the road to Tripoli. After passing Tripoli, you will keep heading for the city of Sparta, then for the town of Molai and finally for Monemvasia. To reach Monemvasia from Kalamata, you will take the road from Kalamata to Sparta. When you pass Sparta, follow the signs to Monemvasia. You will then cross the villages of Skala, Vlachioti and Molai until you reach your destination (146 km distance - 2 hours and 30 minutes ride approximately).